Haddonfield Memorial High School senior Jonathan Baxter had quite an exciting two days last week. Last Sunday, Baxter was named an Eagle Scout during his Court of Honor ceremony. The next day, Baxter was recognized again during a ceremony. 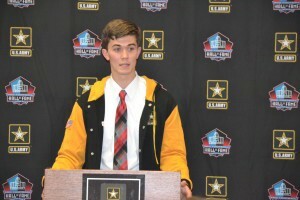 This time, he was honored for being one of 20 high school students from across the country named a finalist for the 2016 U.S. Army–Pro Football Hall of Fame Award for Excellence. 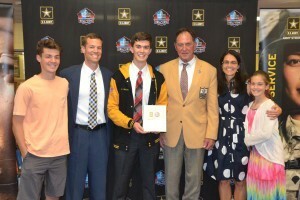 Officials from the United States Army and former Los Angeles Rams defensive lineman and Pro Football Hall of Famer Jack Youngblood presented Baxter with a plaque during a special ceremony last Monday in the high school’s library. Baxter found out he was going to be a finalist in March after applying for the award earlier in the school year. He remembers the moment being one of the most amazing of his life. 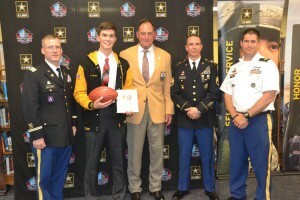 This is the fourth year the U.S. Army and Pro Football Hall of Fame have partnered to present the Award of Excellence program. It is open to all sophomore, junior and senior high school athletes in the United States and recognizes those who excel in academics, athletics and community service. Baxter excelled in all three areas. On the soccer field, Baxter was twice named to the all-Colonial Conference second team. In 2015, Baxter was one of South Jersey’s top goalies with 14 shutouts and 98 saves. He was named to the all-Colonial Conference first team at the end of his final season. Baxter also played basketball at Haddonfield. Baxter performed well in the classroom and is a member of the high school’s National Honor Society. Community service is also a big part of Baxter’s life. He has been a Scout for many years, and his Scouting career culminated with this Eagle Scout Court of Honor last week. Baxter said community service was just as important to him as athletics. He also felt participating in Scouting made him a more well-rounded person. Character was a word brought up multiple times during the ceremony. Youngblood said high character is something both the U.S. Army and pro football teams preach every day. He felt Baxter was the perfect example of someone with high character. “Because you’ve got character, you’re going to keep moving forward,” Youngblood said to Baxter during the ceremony. Ryan Nixon, head coach for Haddonfield’s boys’ soccer team, felt Baxter was the perfect fit for the award because of the way he conducted himself on and off the field. Baxter and the 19 other finalists from across the country will be honored in August in Canton, Ohio, during the Pro Football Hall of Fame’s Enshrinement Weekend. As part of the trip, the finalists get to attend the Hall of Fame Enshrinement Ceremony on Aug. 6, where the winner of the award will be announced. The next day, all of the finalists will get to attend the Hall of Fame Game between the Green Bay Packers and Indianapolis Colts. Next year, Baxter plans to attend The College of New Jersey, where he plans to continue participating in varied extracurricular activities. Baxter said he hopes to play on the men’s soccer team and also participate in a Reserve Officers’ Training Corps program.